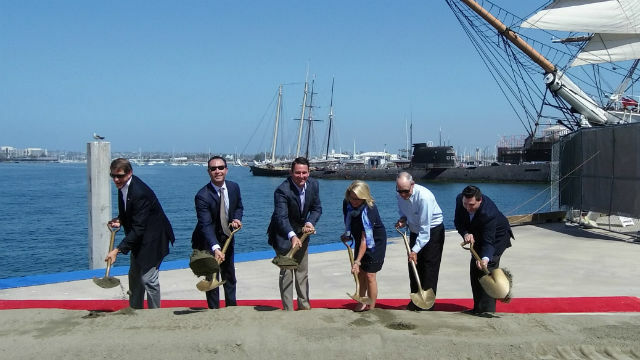 The Port of San Diego broke ground Tuesday on the Portside Pier, a four-restaurant entertainment complex with a public viewing deck that will extend over the bay on new pilings. San Diego-based Brigantine is developing the 42,000 square-foot complex and will operate the four restaurants: Brigantine on the Bay, Miguel’s Cocina, Ketch Grill & Taps and Portside Gelato. The complex replaces the demolished Anthony’s Fish Grotto south of the Maritime Museum of San Diego. Port Chairman Rafael Castellanos said the Portside Pier will occupy “one of Southern California’s flagship restaurants sites” and offer both local residents and visitors “one-of-a-kind sunsets” a and variety of dining options. “This is part of our extreme makeover of San Diego’s front porch,” he said. It’s the first waterside location for The Brigantine, a San Diego-based restaurant operator that has 14 other locations. 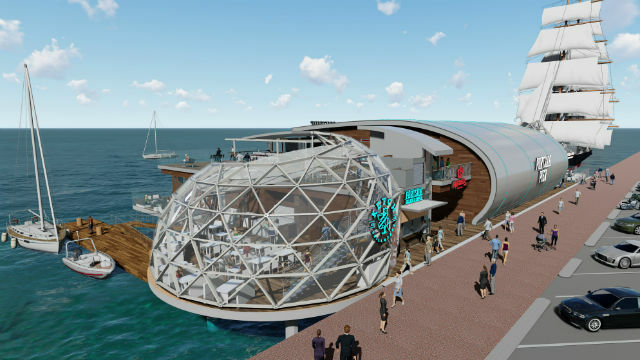 In addition to the four restaurants, the Portside Pier will have two rooftop bars and a dock for visiting boaters. The restaurants will support 250 new jobs and generate $1.1 million in rental income for the port. Opening is scheduled for opening in late 2019.